Many have experienced the dread of opening that yearly Christmas card from friends that you have not seen in a long time and pout falls that letter. The one which tells you exactly what has been going on in their lives for the last 365 days. It is all upbeat and positive, full of wonderful sentiment and love in a perfect world. But is it the truth? Angela Gillespie has always written these yearly letters from the moment she moved from London to the other side of the world to a sheep station in the outback of Australia. As time has progressed so have the letters and with the wonders of technology it is all done by email. Trouble is what is said in the letter is not the truth. Everything is not rosy for the Gillespie’s and Angela is so fed up she just sits down and writes this years letter exactly how it is, as a cathartic process. Her husband Nick seems to be going through a mid-life crisis. He will not talk about the sheep station, he has sold out to the possibility of a mining company on the land and anything financial is always glossed over. All three of her daughters are causing her pain; Genevieve is in America in the world of TV as a hairdresser and it seems her world is about to change. Victoria is working in radio, but her very private affair with a colleague became public property in Australia. They are both coming home for Christmas. Lindy just cannot seem to settle to any job and leaves a trail of debt with her whenever she returns home. Ignatius, the little mistake some years after the girls were born wont have his hair cut, keeps running away from school and is talking to an imaginary friend. Her whole heart is poured out into this letter about her family, her rather annoying relatives, her friends, their remote locations and the worries about her own health. And that is only the beginning of this chunky family saga which drew me right in. 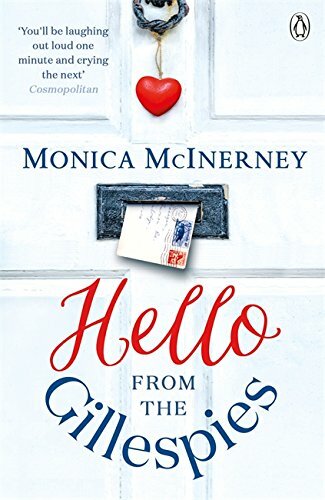 Just when you learn something about a member of the family and think that maybe all their problems are going to be resolved, Monica McInerney throws another problem into the mix and the turmoil is once again all around them. A lot of them I did not see coming which is why I had to keep reading. The book covers so many issues but at it heart is the love of a family and how they all interact no matter what their problems or where they are located. Setting it on a sheep station in the outback just showed how you can be isolated not just physically but emotionally from all those around you. I learnt much about what life must be like for those who are in this situation. At times I wanted to experience it for myself, but when you realise the journey you have to take for something which I take for granted, such as seeing a doctor perhaps not. I have always enjoyed Monica McInerney’s novels and this one is no exception, there is so much packed into the book that you are getting a story plus more! Thoroughly recommended. This book will be published on 6 November 2014. I was sent this novel by a magazine in return for filling in a questionnaire about the novel for them to use in a forthcoming issue. I chose this novel as I have read her novels before and I was thrilled that I did pick it. I had forgotten on all consuming and enjoyable they were. I have one on my shelf now just screaming out to be read!